Gout is a condition that can takes years to manifest in your body. It generally comes from continually raised uric acid levels, which can come from hereditary factors including, diet, weight and gender. Some races tend to suffer it more than others and it tends to strike in mid to late life. If you reading this page, you are no doubt looking for a natural herbal product to help your body get rid of this painful and debilitating disease – and you’ve found it! Prescription medicines can in many cases cause more long term damage than good, and we are pleased to be able to offer you an effective alternative. GoutCare’s powerful natural ingredients works with the body’s natural defence systems to go to the root of the problem and eliminate the stored uric acid in the joints and connective tissue. It doesn’t attempt to suppress the uric acid like allopurinol. 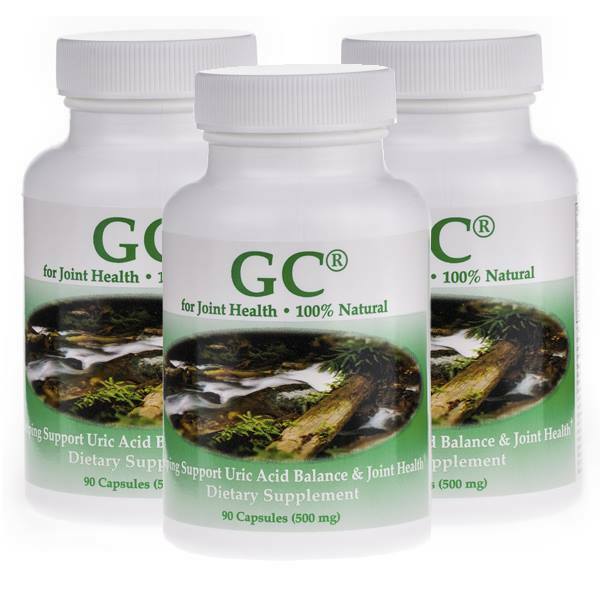 GC® can help enhance the body’s ability to keep the uric acid from crystallizing. It increases the removal of uric acid from the blood stream to transport it out of the body by way of the urinary disposal system. GC® also boosts the digestive system’s ability to process the purines and dispose of the excess production, before the point of storage in the joints. This combination is fundamental to your success, and often the missing link for those who have dieted alone without success. Slowing the uric acid production, while a crucial component, is only half of the battle. You must trigger the systems of the body to deal with this natural substance in a healthy manner. Our herbal blend provides this essential communication. Unlike many modern prescription medicines that act as a band aid for gout symptoms, we aim to truly solve the problem. GC® after many years of research has been scientifically designed with the help of Doctors and naturopaths to naturally aid the body in fighting uric acid build up to create a 100% natural and effective gout supplement. GoutCare along with a suitable gout diet is the best answer to for a natural gout treatment. Imagine pouring enough salt in a glass of pure water. At first the salt is invisible as it dissolves, but eventually the water can only hide so much salt. If you keep pouring salt in the glass you will see its crystals forming and reappearing at the bottom of the glass. This is how the uric acid becomes pain causing crystals in your joints. When your body cannot absorb any more acid it eventually turns into gouty arthritis. Our herbal blend proceeds directly to the root of most gout problems, uric acid production and crystallization. Seeking to unnaturally suppress uric acid production altogether, such as allopurinol would, can yield potentially dangerous consequences. In order to deal with uric acid properly, you must first slow the production. This segment of uric acid control can easily be attained through a balanced diet, vitamins and minerals, and proper water intake. The complicated part is ensuring that it remains soluble in order for the body to dispose of any excess uric acid to prevent it from crystallising. GC® was designed by scientists and doctors using unique blends of 100 % organic natural herbs and minerals all of which have natural certain characteristics to help your body treat gout naturally. Tests have shown that taking GC® for prolonged periods of time can drop the uric acid levels in the body giving you your mobility back and stopping the acute pain in the joints. If you want to eat those foods and drinks you’ve been avoiding (within reason) and live life to its fullest again, GoutCare is the answer. GoutCare’s formula is 100 % ORGANIC, ALL NATURAL and is a tested and proven combination of powerful herbs which act as a remedy for natural gout support. What’s more the ingredients in Gout cares formula also help the body in many other ways. Helps to detoxify the body and protect against infection, aids in enhancing the immune system and aids in lowering blood pressure and influences improved circulation. It has no odour, is richer in antioxidants than fresh and other forms of Garlic and is effective in protecting against cardiovascular disease. Aged Garlic has been linked with lowering cholesterol, cancer, aging, and drug toxicity. Garlic has been shown to have potent anti-cancer effects, reducing the risk of human stomach, colon, and prostate cancer. In pre-clinical studies, Aged garlic help prevented cancers of the mammary glands, bladder, colon, stomach, liver, lung, and oesophagus. Aids in blood purifying and helps metabolise the minerals and purines in food. Yucca stalk is also reputed in western herbal tradition and aids to support joints and blood sugar problems. (One of Mother Nature’s own natural gout remedies). Yucca Saponins, and other components of Yucca as well, have ammonia-binding activity. When ammonia is processed by the liver, uric acid is created. When added to the diet, Yucca Saponins pass the ammonia through the digestive tract unabsorbed and are then excreted in the faeces. Yucca is a rich storehouse of Phytochemicals with many useful and important functions in human and animal nutrition. Widely known for its powerful antioxidant and inflammatory properties, it also aids in protecting the liver against toxins and helps to lower bad cholesterol. Tumeric has also been used in Chinese medicine to help clear infections on the inside and outside of the body. It has also been use in Indian medicine and is popular in cosmetics due to its ability to help enrich the skin. UCLA has reported that curcumin (tumeric) is a powerful anti-inflammatory, safer and more efficient than Ibuprofen, and revealed to be effective in the prevention of Alzheimer’s. Milk Thistle is unique in its ability to help protect the liver and has no equivalent in the pharmaceutical world. This is a type of flavonoid and one of the most helpful liver protecting substances known. It helps to stimulate new liver cell growth and is a natural cleanser. Activation of natural killer cells to reduce cancer risk. Increased levels of infection-fighting immunoglobulins. Aids the ability to maintain healthy blood sugar levels and prevent post-meal spikes in blood sugar, as well as improved insulin secretion. GC® may help lower the insulin requirements of type two Diabetics. Please monitor your glucose levels closely, and if necessary, be sure to adjust your insulin accordingly. Some type two Diabetics have even reversed their need for insulin altogether. The herbs in GC® aid to improve liver function. This can increase communication between the liver and pancreas, generating improved insulin output from the pancreas. This herbal blend renders unparalleled success serving to enhance the immune system, detoxify the liver, promote new cell growth, protect against infection, improve circulation, aid to metabolize the minerals in food for better digestion, as well as possessing the anti-inflammatory and positive cholesterol effects mentioned above. GC® GoutCare is THE superior choice for the overall health of anyone with or without gout. Manufactured and bottled under strict FDA guidelines by a Leading Pharmaceutical Company in Salisbury, Maryland, USA.